Registration opens in early March. Online registration will be found here on our site with the option to pay with PayPal or sending a check after registering online. Students may register for one week. Please note that registration is not complete until payment is received. Payment may be made through PayPal or by check. If by check, a two week time period will be allowed for receipt of the check. If not received, the reserved space may be opened to others. No phone, email, or fax reservations (registrations) will be accepted, and we are unable to accept cash or credit card at this time. Medical Releases and behavior contracts may be mailed or emailed as a PDF attachment. See forms, mailing and email addresses below. Please note that the mailing address is different than prior years. Students may register for a second week beginning May 15. This helps us ensure that all students have to opportunity for at least one week of camp each summer. Classes are Monday through Friday 9:30 a.m. to 4:00 p.m. Arrive at least 15 minutes earlier on the first day of sailing school and meet in the sailing school room on the first floor of the Deep Creek Yacht Club at Turkey Neck. 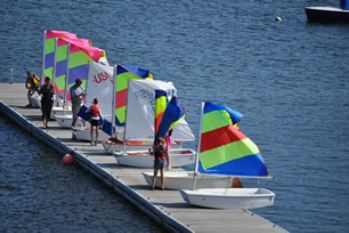 On the last day of sailing school during youth weeks, parents or grandparents should arrive by 3:00 p.m. for an end-of-week closing ceremony and awards. Be sure to check what to bring before arriving at class. A single $50 discount will be provided to sailor who provides his or her own boat. Limit one per sailor for junior and advanced Laser weeks, and one per boat for adult weeks. Classes meet Monday through Friday 9:30 a.m. to 4:00 p.m. either in the sailing school room on the first floor of Deep Creek Yacht Club at Turkey Neck or in the upstairs meeting room of Deep Creek Yacht Club at Deer Haven. Check your week for location. Not able to dedicate a full week to sailing school? Pick a Monday tt Wednesday for a reduced rate. Be sure to check what to bring before arriving at class. A single $50 discount will be provided to one of two sailors (if registering as a couple) who provides his or her own boat. Practice boat speed, sail trim, tactics, starting, crew work, and more. Coaches include Tyler Andrews, Melanie Dunham and other Gold Fleet Skippers. Great preparation for the Sandy Douglas regatta. Includes assessments, video and advice at the Wednesday night races at the Turkey Neck Yacht Club. Registration for the adult weeks, advanced laser teen week and any single week of junior week opens the first week of March. Once students are confirmed in their first week choices, they may register for a second week beginning May 15. This helps us ensure that all students have to opportunity for at least one week of camp each summer. The application, other forms and checks should be mailed. No phone, email, or fax reservations will be accepted, and we are unable to accept cash or credit card at this time. Register online now by clicking junior registration. Please mail or email medical form and behavioral contracts to the registrar address below. Register online now by clicking Adult Registration. Please mail or email medical form to the registrar address below.